Designed for the home mechanic. this simple and effective bearing press will extract and insert linkage bearings with ease. Thanks to a CNC construction this tool is ulta durable. 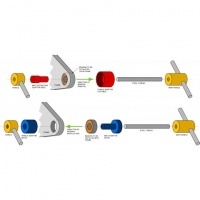 A wide range of adaptors are available to suit almost any linkage bearing. The bearing press and adaptors are supplied separately so you can customize the bearing press kit to suit your requirements for greater value for money. 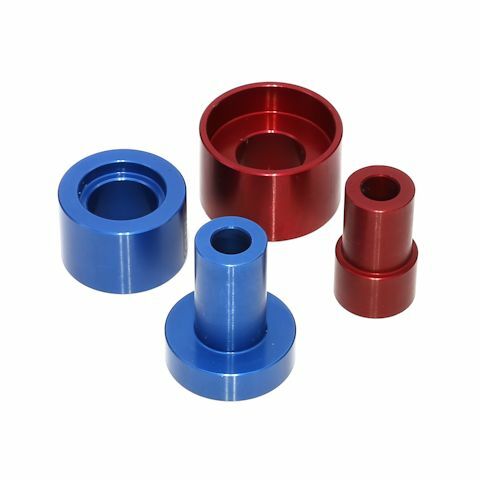 Adaptor kits are supplied with full extraction and insertion fittings. For more information on adaptor kits see the below table. NOTE: Bearing kits 1, 2 & 3 don't have male adaptors (just female ones) due to the small size of the bearing bore hole. Wych Bearings Ltd accepts no liability for any damage caused, or consequential loss, arising from improper use of the Bearing Press & Extraction Tool, always use the fitting instructions provided. 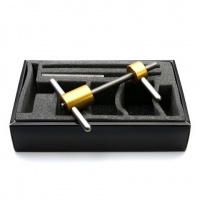 When used with the adaptor kits which are equally impressive this tool is great! I used it on my full suspension mountain bike pivot bearings for removal and installation. Made the job easy. Excellent product and service. Made the job on my bike a breeze!! Works well and looks like it will last. Realy makes the job easy. Bearings come out en can be placed even by me. And, once placed they sit undamaged and better. Used this to replace the all the bearings on my Stumpjumper FSR. Was an absolute doddle to use, very well made and combined with the RRP bearing tools had the job done in under 30 minutes. Fantastic service from Wych bearings too.